That a single currency, the euro, would fracture rather than unite Europe was understood long before the euro’s introduction as legal tender on January 1, 2002. The euro, the currency of 19 of the 28 member states of the European Union, is only one of the various institutions tying the member nations of the European union together, but it is the linchpin of the financial integration touted as one of the primary benefits of EU membership. Skepticism of the benefits of EU membership is rising, as citizens of the member nations are questioning the surrender of national sovereignty with renewed intensity. The technocrat elite that holds power in the EU is attempting to marginalize critics as populists, nationalists or fascists, overlooking the untidy reality that the actual source of tyranny is arguably the unelected bureaucrats of the EU who have taken on extraordinary powers to strip the citizenry of member states of civil liberties (i.e. the right to dissent) and of meaningful political enfranchisement. As I have patiently explained since 2012, the underlying structure of the EU is neocolonialism, specifically, neocolonial-financialization. Stripped of artifice, the financial institutions of the EU core have colonized the EU periphery via the euro and the EU and imposed a modernized system of extractive serfdom on the citizenry of the core and periphery alike. To understand the neocolonial-financialization model, we must revisit the classic model of colonialism. In the old model of Colonialism, the colonizing power conquered or co-opted the Power Elites of the region, and proceeded to exploit the new colony’s resources and labor to enrich the core or center, i.e. the Imperial nation and its ruling elites. This traditional model of colonialism was forcibly dismantled in the 1940s-1960s. Former colonies established their political independence, a process that diminished the wealth and control of former colonial powers. In response, global financial powers sought financial control rather than political control. This is the key dynamic of the Neocolonial-Financialization Model(May 24, 2012), which substitutes the economic power of financialization (debt, leverage and speculation) for the raw power of conquest and political control. The main strategy of financialization is: extend cheap credit to those with limited access to capital. Those with limited access to capital will swallow the bait and willingly agree to onerous conditions. Then, when the credit expansion reaches levels that cannot be supported, the lenders demand collateral and/or favorable trade and financial concessions. These tactics have been well-documented in books such as The Shock Doctrine: The Rise of Disaster Capitalism and Confessions of an Economic Hit Man. But the economic pillaging of former colonies has limits, and as a consequence the global financial powers developed the Neocolonial Model, which turns these same techniques on one’s home region. Thus Greece and other capital-poor European nations were recognized as the periphery that could be exploited by the core, and the euro was the ideal tool to exploit the economies of nations which could never have generated credit/housing bubbles without the wide-open spigots of cheap credit flooding their economies. In Neocolonialism, the forces of financialization are used to indenture the local Elites and populace to the financial core: the peripheral “colonials” borrow money to buy the finished goods manufactured in the core economies, enriching the Imperial Elites with A) the profits made selling goods to the debtors B) interest on credit extended to the peripheral colonies to buy the core economies’ goods and “live large”, and C) the transactional skim of financializing peripheral assets such as real estate and State debt. In essence, the French and German banks colonized Europe’s periphery nations via the financializing euro, which enabled a massive expansion of debt and consumption in the periphery. The banks and exporters of the core extracted enormous profits from the periphery via this expansion of debt and consumption. The assets and income of the periphery are flowing to the core as interest on the private and sovereign debts that are owed to the core’s money-center private banks. 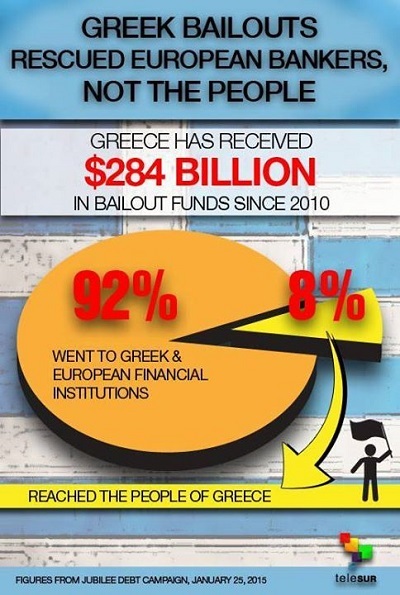 Note how little of the Greek “bailout” actually went to the citizenry of Greece and how much was interest paid to the financial powers. The core has stripped Greece of collateral and political independence, just as the colonial powers of the 19th century stripped the African and Indo-Asian regions of income, assets and political independence. This is not just the perfection of neocolonialism but of neofeudalism as well.The peripheral nations of the EU are effectively neocolonial debtors of the core, and the taxpayers of the core nations are now feudal serfs whose labor is devoted to making good on any financialization schemes that go bad. Neocolonialism benefits both the core’s financial Aristocracy and the periphery’s oligarchies. This is ably demonstrated in the essay Misrule of the Few: How the Oligarchs Ruined Greece. The EU has finally reached the endgame of the Neocolonial-Financialization Model. There are no more markets to exploit with financialization, no more assets to strip, and the serfs (a.k.a. yellow vests) of the core are tiring of being stripmined in service of the EU kleptocracy. At this point, the financial Aristocracy has an unsolvable dilemma: writing off defaulted debt also writes off assets and income streams, for every debt is the core’s asset and income stream. When all those phantom assets are recognized as worthless, the system implodes. This exhaustion of the neocolonial-neofeudal model was inevitable and as a result, so too is the decline and fall of the European integration/exploitation project. This entry was posted in General and tagged euro, european union, Neocolonial-Financialization Model, neofeudalism. Bookmark the permalink.